Catalign Innovation Consulting: Does “fail fast” contradict with “first time right”? Does “fail fast” contradict with “first time right”? “Fail fast” is one of the principles I champion in my workshops on innovation and design thinking. “First time right” has been popularized by the quality movement, especially by the Six Sigma methodology. Hence, it is not uncommon to get the question: Does “fail fast” contradict with “first time right”? To explore this question, it would help to understand “fail fast” and “first time right” better. Let’s start with “fail fast”. Does “fail fast” imply failing in any kind of way? No. To understand this better, let’s see the difference between a failure due to checklist-oversight and a negative result during hypothesis testing. Let’s borrow an example from Jeff Bezos of Amazon. In an interview, he said that if Amazon goofs up the opening of 19th fulfillment center where an operational history exists, then that would be poor execution. Let’s call this checklist oversight failure. It means a prior learning has been consolidated into a checklist and the failure occurred because the checklist was not followed rigorously. 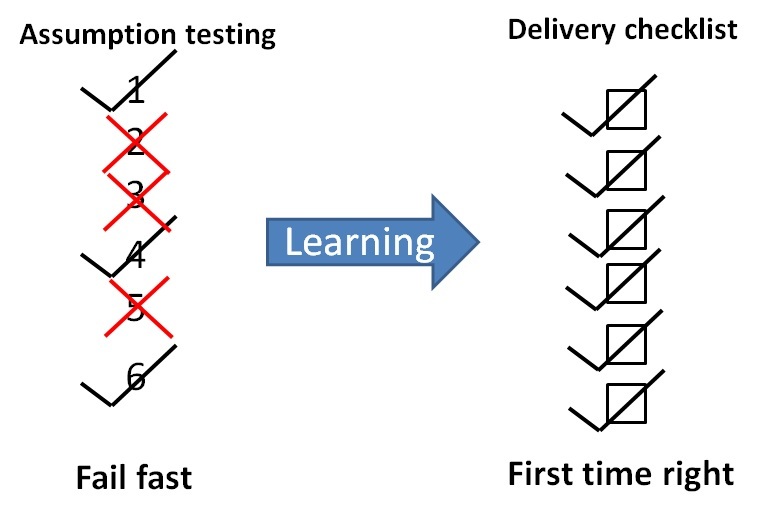 “First time right” uses all the available past data in constructing the process to be followed for delivery of a solution. In contrast, let’s look at the following hypothetical assumption: Amazon will be able to deliver a book size packet reliably on the terrace of a ten storied building in Bangalore via drone delivery. Let’s assume Amazon has experience of this kind of delivery in countries like the US but not in India. And if the first attempt at doing this delivery fails, then it would be a failure of the second kind – hypothesis test failure. Note that this failure would result in some learning which can be incorporated in the second attempt and so on. Depending upon the difficulty encountered, the cost of each experiment and the importance of this use-case for Amazon, more attempts would be made to learn more about this use-case. When I say “fail fast” I mean fast testing of the assumptions associated with an idea. Now, we can see that “fail fast” is quite complementary with “first time right”. If Amazon were to launch the drone delivery on the terrace and get it right the first time, then it would help to do as many tests in different contexts – weather conditions, building locations, different building structures etc. Thus it would help to fail fast to get it right the first time you go live. “Fail fast” assumes that there are certain unknowns / risks associated with achieving the goal. If all the steps in achieving the goal are well understood, then “fail fast” would not be required. 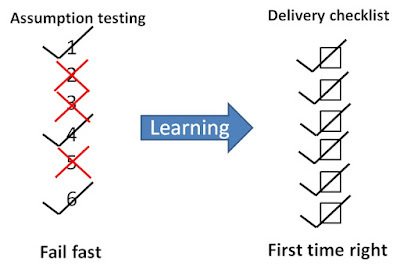 In short, “fail fast” helps you deliver “first time right”. The riskier your project, i.e. the higher the cost of getting it wrong the first time, the more important it becomes to “fail fast” in order to get it “first time right”. Interesting read. I'll try to frame what I understood in my own words to be sure I understood it right. Fail fast is about testing all possible assumptions in the prototyping/beta testing phase while first time right is about ensuring that we start off running when we roll out the product/service. If the assumption testing is done properly, it will ensure that we can roll out without any issues. Yes Divya, you got it right. Assumption testing can begin even before you have an idea (or solution) in mind. How? You can test some of the assumptions associated with the problem statement. If the testing is done properly, it will increase the chance that your product / service will be adopted. Will it ensure? I doubt. It is good to hear from you. Don't see you or Bhatti on the lake at all. Thanks for your comment.